Could it fit a crosman 2240? The UTG model should work this one looks to big to fit the barrel . 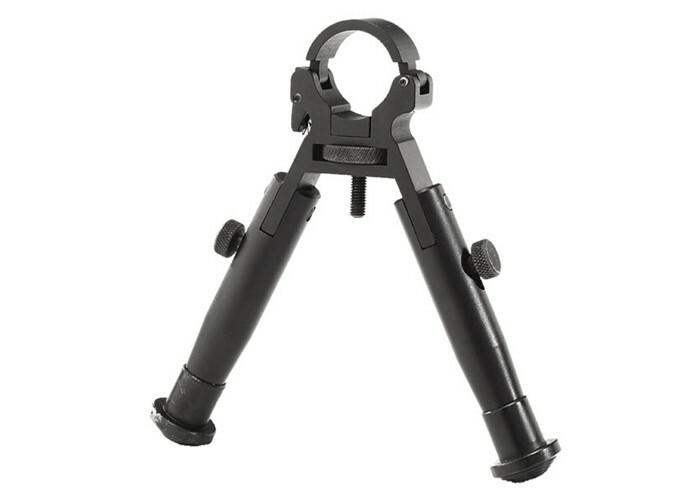 Does this bipod fit on a benjamin titan NP? Adjustable from 11mm to 31mm it should fit , measure your barrel. How long are the legs in total? Extended and unextended? Doesn't mention how long the legs are? Not much more than 4 inches reviewers say legs only extend another inch or so. Call PA they could advise? Will this clamp onto the air tube that is under the barrel of the Gamo Coyote, without interfering with, or being interfered by, the gun barrel? I would be cautious about clamping any thing to the air tube. Sling swivel mounts can be installed in the forearm of the stock. Google it. It shows how? Only about an inch , reviewers say. Read the customer reviews airgunners say this will fit? Will it fit the Benjamin Trail NP2? You would need to measure the shroud diameter, if it is under 31mm this bipod would fit. Although I wouldn't recommend a bipod on a break barrel. Puts a lot of unnecessary force and stress on your barrel/shroud. Can it fit Umarex Fusion CO2 rifle?